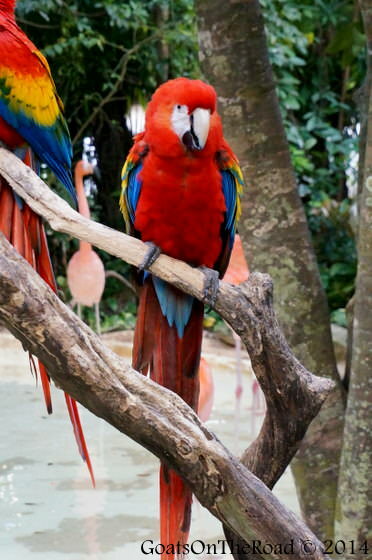 Xcaret is an eco-theme park located in the Riviera Maya, just south of Playa del Carmen. Spanning 80 hectares (200 acres) and named after the Maya village of the same name, this is one of the most visited attractions in all of the Quintana Roo State! Over a million people come here each year to experience the exciting nature and cultural based activities. As you know, we don’t usually like to visit attractions that are packed with people. However, we were pleasantly surprised with what we were shown here. 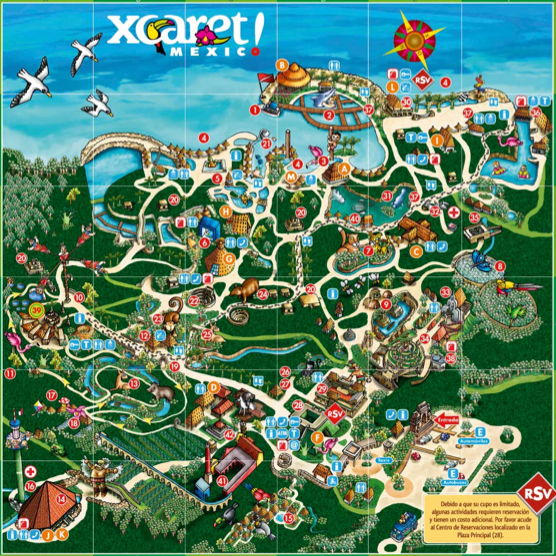 Xcaret Park is huge…make sure to get yourself a map! 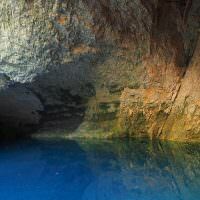 Xcaret offers everything from snorkelling in underground rivers to 5 star restaurants. We only had a few hours at the park so we weren’t able to even scratch the surface of what is on offer here, but we were able to meet with the very sociable Leo, who is the Online Public Relations Executive of Xcaret. We only had about 20 minutes before our “Mexico Espectacular” dinner and a show commenced, but Leo was able to show us around the property a bit and introduce us to a successful breeding program they have in place to help increase the number of colourful Macaw parrots back into the wild. A new addition to the park is the Vine de Mexico Wine Cellar! 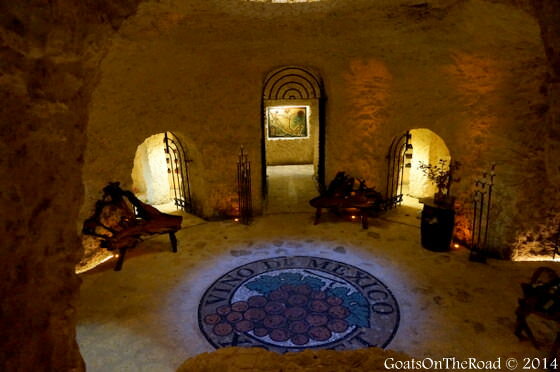 Showcasing over 157 Mexican wine labels, this cellar was stunning, and only made us upset that we couldn’t stick around to do a tasting and food pairing. It definitely looked like it would have made our list of favourites wineries & cellars of the world. After our quick tour of the area, we arrived at the Gran Tlachco Theater. With a seating capacity of over 8,000 people, it looked like an enormous Mayan football stadium. Would love to do a wine tasting at this beautiful wine cellar! This was the setting for our spectacular dinner and theatre experience. We took our seats, which had a lovely table setting ready for us with a fresh juice drink and three bite-sized canapés. We were handed a menu that glowed in the dark and had the choice between three fantastic appetizers and entrées. 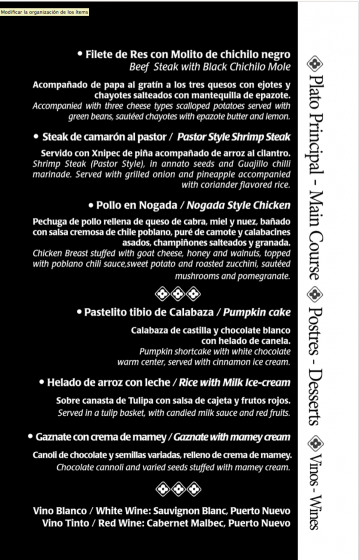 I choose the beef steak with black chichilo mole sauce with 3 cheese scalloped potatoes and green beans. Nick went for the shrimp steak with annatto seeds and guajillo chili marinade accompanied by grilled onion, pineapple and rice. Both of which were delicious options! Our meal was served throughout the show and was rounded off with an amazing pumpkin cake with white chocolate center and cinnamon flavoured ice cream. Needless to say, we were more than satisfied. 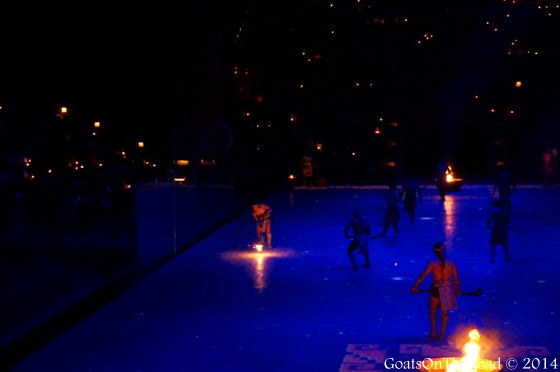 The show opened with men playing the traditional Maya ball games, one of which was fireball hockey! This wasn’t a pretend game that was being put on for the crowd, full efforts were being made to score a goal. Being from Canada, we love hockey, so to see this ancient version being played in Mexico with a flaming ball was pretty cool. Hockey in Mexico? Fire hockey is a new favourite of ours! We were engaged and on the edge of our seats for the whole two hours of the different performances. There were over 300 artists on stage throughout the evening, each of which wore traditional clothing that was tailor-made and very authentic looking. The program really showcased the history of Mexico from the pre-Hispanic times to present day. The clothing, song and dance of each State in the country was represented nicely as well. It was lively, entertaining and very well choreographed. 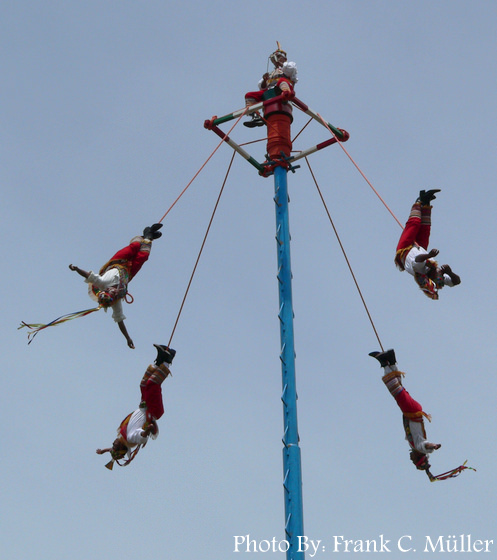 At one point, there were 4 men representing the State of Varacruz sitting precariously on a 30 meter high, wobbly, wooden pole with a small seating area on the top. They were playing flute music and drums when suddenly, four out of the five men jumped off and spun around the pole, each dangling from a colorful ribbon that was attached to their ankles. One myth says that this ancient ceremony/ritual was created as a way to appease the Gods and bring back the rains, in hopes of ending severe drought. It seems pretty extreme to risk life and limb for rain, but the spectacle was incredible to watch. After enjoying our three course meal with wine, the wonderful service of the wait staff and the fantastically entertaining show, we were most definitely ready for sleep. We parted ways with Leo and were driven out to our accommodation, where we were to spend the next 4 nights. This place was definitely one of the nicest places we’ve ever stayed! The day pass for Xcaret Park is $99 for adults and includes more than 40 activities, showers, dressing rooms, dry bags for your belongings when you’re in the water, life vests, parking and entrance to the Mexico Espectacular Show (dinner is an extra $50). If you book your day pass online, you will receive 10% off the entrance fee. The park is open from 8:30am to 9:30pm. Since the park is so massive, you may opt for the 2-day pass, which costs $149 for adults. 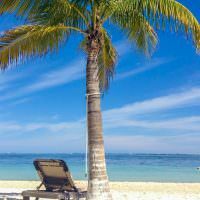 There are many options for add-ons at Xcaret so your best bet is to have a look at their website and decide what works best for you. 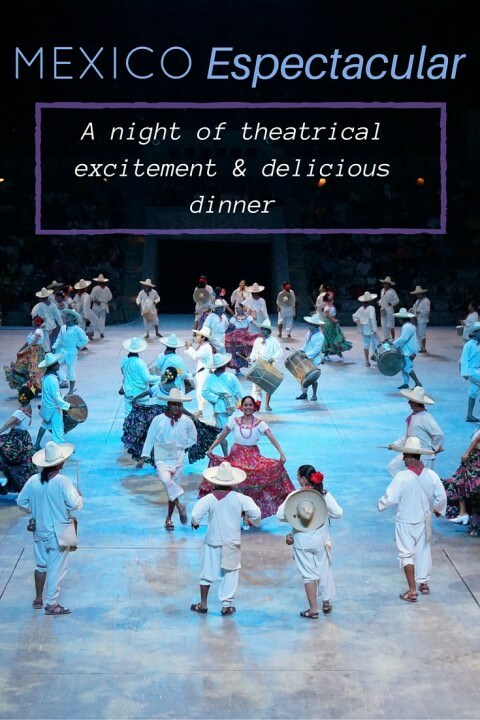 Have you ever been to a cultural dinner and a show? What do you think of this pole swinging?! Share with us below. Amazing pics.I will surely plan my upcoming vacation to this place.thanks for posting nice views..
Great! Glad to hear it. Make sure to do the dinner and a show! I agree, cultural shows are a great way to learn about different ways of life and traditions for sure. We also went to one in Bali, in Ubud – where was the show you saw? As for the pole swinging, count me out. 99 dollars … or 99 pesos? If its the latter, I’ll definitely go here when I’m in the PDL area later this year! Hey Heather, that’s 99 US dollars. 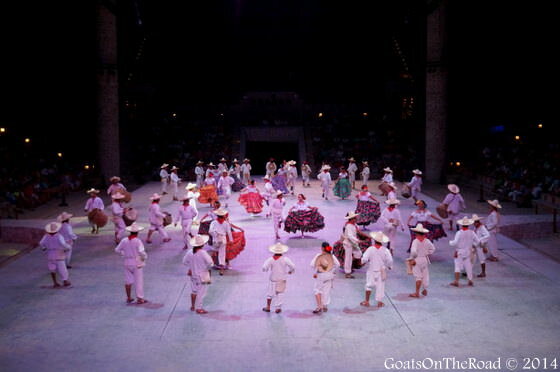 But it does cover a lot of different activities and adventures in the park…including the Mexico Espectacular show! Loved your article. It sounds as though you are having a great time. As usual, we will look forward to your next adventure. 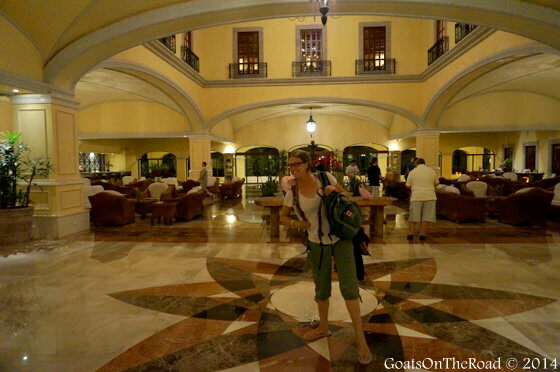 We missed Xcaret when we were there but will have to put it on our list if we go back. Keep safe.